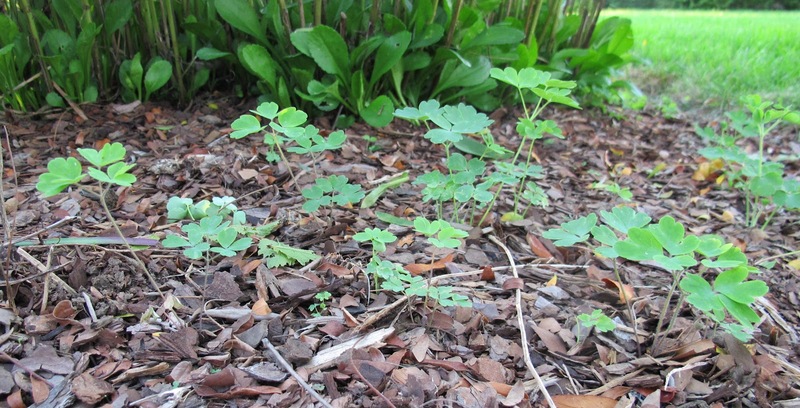 I am reminded that a garden lightly tended will yield some lovely surprises, like this little field of columbine seedlings on the edge of Plopper's Field. I crawled around and through Plopper's Field late yesterday clearing out thistle and other weeds and cutting back spent blooms and drought-dried stems and leaves. Overall, I was pleased to see what was left. It is not as lush and full of bloom as in the spring, but it is not really supposed to be at the end of the growing season, or after three months of drought. 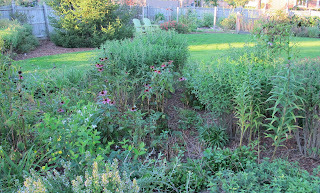 Many of the plants in Plopper's Field, including clematis, coneflowers, daylilies, daisies, asters, sages, campanulas and penstemons are also perking up, now that we've had rain and cooler temperatures. My part in all of this was to do mostly nothing. I left the plants alone and pulled the weeds as I could. These plants remind me that they want to survive and have mechanisms to survive. Those that don't - well, I'm not all that interested in coddling plants. I like a garden lightly tended and prefer those plants that know how to survive in such a space. Plopper's Field will have one last show for me this fall when the asters bloom. I look forward to the show, which will include not only the blooms but also the pollinators, including bees and butterflies. They like a garden lightly tended, too. Lightly tended... love that phrase. It describes my style when the temps are so high. 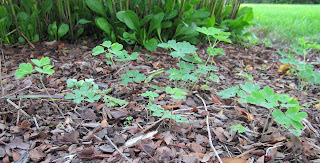 I am frequently surprised by self seeded plants - sometimes popping up in very unexpected places. Who can say why clumps of hyssop are blooming in the Shed Rose Bed? I agree with your approach. Let the plants figure out where they want to be, you will get some good surprises. Love it, 'Plopper's Field' I'm going to borrow that one. Very sweet, and congratulations on having the foresight to plant those things that want to survive. We call it the Semi School here, after my daughter who does nothing at all and has a beautiful, if wild garden. I like a lightly tended garden, too. I am glad there is life after the drought in Indiana. I like that term, Carol. Many of my gardens are lightly tended! Lovely garden indeed! Thanks a lot for the wonderful page. Brilliant post indeed. Thanks for instigating GBBD and for sharing your blooms!